Too many investors dive into real estate head first. They think buying property equals success. This can lead to buying the wrong property, in the wrong area, with the wrong financing. We call this lazy investing. Lazy investors don’t take the time to educate themselves; a huge mistake that often means the difference between money in your pocket and money down the drain. Don’t be a lazy investor. Research, research, research! Take the time to educate yourself on the market, the area your potential property is located and the growth rate of the region. Check out the zoning laws. Is the area up-and-coming or on a downward spiral to slumville? Are there businesses and jobs coming to town? What types of schools are nearby? Is there a low cost of living? Is it a safe place to live? Will it be easy to add a road or well to the property? Knowing the answers to these questions is a quick Google search or phone call away and can save you time and money in the long run. On the flip side, there is such thing as too much research. Especially when using that research as a stall tactic. This is called analysis paralysis. When a real estate investor or aspiring investor runs the numbers over and over until they convince themselves that it’s a bad deal, they end up never actually investing in anything. In short, they research it to death. Before they know it, the deal passes them by. Have a plan. First, write out the ideal property investment including how much cash flow or profit you want to make and how much you want to spend. Next, write out specifics on the deal you are looking for: price, neighborhood, condition and location. Then one-by-one check those things off the list as deals come your way. By having a set of guidelines you’re more likely to see a good deal for what it is and finally be able to move forward with your investment. This is one of the most common mistakes many new investors make. They think they will save money by managing the property themselves. Never mind most of them don’t have experience handling tenant disputes, home repairs or landscaping issues. Plus, factor in the stress and time spent doing it all, and they end up losing more than saving in the end. This depends on the property. For rentals, hiring a property manager can save you time and stress as they handle things like: collecting rent, tenant disputes, evictions, and keeping an eye on the property. A good property manager will also keep track of your accounting and taxes each year. For flipping a property, hiring a contractor can save you valuable time. And when it comes to flipping, time is of the essence. If you aren’t familiar with home improvements, a contractor can get the job done quickly. For raw land investment, outsource the important stuff. Unless you plan on drilling for water yourself, find a specialist to perk the plot for a well. Since most investors have full-time jobs, outsourcing is the perfect way to earn without the stress. Calculate the numbers. Know exactly how much you can afford to invest and don’t consider anything out of your price range. Then calculate how much you need to make on your investment before you can comfortably add another property. Staying cash flow positive is the best testament to a growing investor as opposed to one who’s just expanding. Remember, real estate is all about numbers. Understanding your numbers will pay out big in the end. Most first time investors become investors by accident. They either come into property through inheritance or grow equity in a house they already live in. Rather than sell the house, they decide to rent it out. However, that house, whether inherited or lived in, was never meant to be a rental. So what seems like a good investment to rent, turns out to be more hassle than it’s worth. Before long, they’re living with two mortgages and struggling to get by. 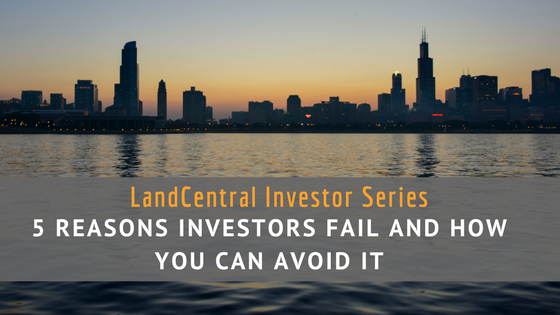 This can often put investors under and have them swearing off real estate investing for good. Educate yourself on the market. What is the going rate for rentals in your area? Do you have the cash flow to support your rental without tenants? If your property is vacant land, look into what other properties in the area are selling for and what amenities buyers are looking for. Should you flip it quickly or hold onto it until the market is right? The bottom line: if you do find yourself as an accidental investor, turn to a trusted source for investing advice. Hint, hint...LandCentral = trusted source. Did we mention we’re in the business of selling land? Ready to seal the deal? Check out what’s next in the series. Your Financial Freedom is Calling! Invest Now! In case you missed it, find out What Kind of Investor Are You? Easements 101: What Are They and Why Are They Important?